NEW YORK — For decades, workers in Europe, South America and China have been celebrated with an official holiday on May Day. The United States, however, has not followed suit. (And Britain and Canada have tried to wash out the holiday’s leftist hues.) Even though the day’s origins date to a riot in Chicago in 1886 known as the Haymarket massacre, labor is celebrated Stateside in early September. Socialists and trade union movements have long used May Day as a protest day. 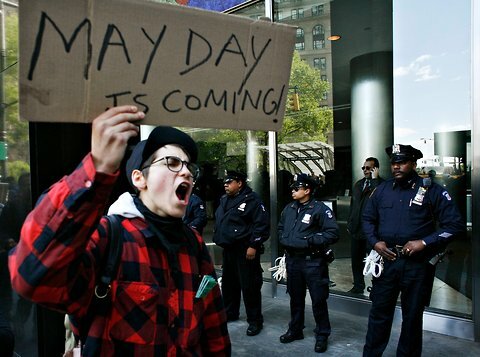 And on Tuesday, May 1, the Occupy movement will attempt to bring 125 U.S. cities to a standstill in commemoration of International Workers Day. The Occupy Wall Street movement is orchestrating what its supporters hope will be a nationwide general strike with students, workers and everyone who is an employee skipping work. The protesters are pressing for economic justice while railing against large corporations that are perceived as not paying their fair share of taxes, an example which of Charles Duhigg and David Kocieniewski detailed in The Times on Sunday. The Occupy movement, which began late last summer, remained boisterous through the fall until many occupiers were ejected from parks around the country and it became too cold to continue to camp outside. Now, rising temperatures are drawing more and more of the disgruntled out of hibernation. For the Big Apple, numerous protests and marches are planned to disrupt business as usual on Wall Street. New York’s billionaire mayor, Michael R. Bloomberg, said Sunday that the city’s police force is ready and city officials are prepared to protect the rights of demonstrators. University lecturers are being asked to move their classes to a Manhattan park as part of the skills-building process. The May Day actions will kick off other demonstrations, most notably around the North Atlantic Treaty Organization summit meeting in Chicago. Some 28 world leaders are expected at the NATO gathering a> on May 20. When it was first announced that a Group of 8 meeting would precede the NATO conference, antiwar groups and other protesters had hoped for a chance to have multiple protests while the world’s eyes are on Chicago. But President Barack Obama has moved the G-8 summit meeting to Camp David, the presidential retreat in Maryland. Occupy supporters will also head there.